Secretary of HCMC Party Committee Nguyen Thien Nhan yesterday met for an exchange of views with French Prime Minister Édouard Philippe during an official visit to Vietnam by the PM and a French high ranking delegation. At the meeting, Mr. Nhan appreciated the French Government’s priority to development cooperation with HCMC for the last past. HCMC has a historical depth in cultural exchange with France with many French style architectural works such as the Municipal Theatre of HCMC, also known as Saigon Opera House and Notre-Dame Cathedral Basilica of Saigon, said Mr. Nhan. The city is one of Vietnam’s localities having a crowd of French speakers, added him. Mr. Nhan emphasized that French collaboration projects are most implemented in HCMC such as French University Center (PUF) under HCMC National University, the high quality engineer training program under HCMC University of Technology, the Institute of Cultural Exchange with France (IDECAF), Marguerite Duras International School, Heart Institute of HCMC and Centre Medical International. HCMC and Lyon city have recently signed a cooperation agreement in the phase of 2018-2020 in urban field, illumination, economic development and human resource training for urban management. Introducing HCMC strengths and potentials, Mr. Nguyen Thien Nhan welcomed French businesses to invest in smart city, innovative district, human resource training for industry 4.0, climate change and waste treatment projects. He hoped HCMC to speed up cooperation with French experts to implement plans to preserve cultural, historical and architectural relic sites bearing specific characteristics of the city. 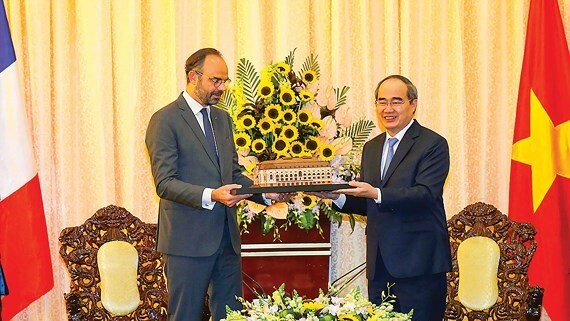 French Prime Minister Édouard Philippe thanked for the royal treatment which HCMC leaders and residents gave the French delegation and appreciated the cooperation efficiency between HCMC and France in many fields. He expected that the city’s leaders will continue paying attention to and assisting French side to carry out French house project and Marguerite Duras International School expansion. The PM hoped to expand and develop the cooperation relationship between HCMC and French localities. Previously, the French Prime Minister attended the opening ceremony of Centre Medical International and a technology workshop in HCMC. 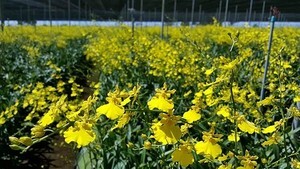 Besides health check and treatment, the center will perform supporting and training activities to Vietnamese doctors and physicians, he said at the opening ceremony. At the workshop, he stressed that creativeness and renewal are the vital factor to startups. The French Government committed to supporting startups to materialize their ideas, having a strategy to build startup eco system and siding with small and medium enterprises in starting a business. On the same day’s evening, Prime Minister Édouard Philippe and the French delegation left HCMC and wrapped up the official visit to Vietnam.